Whoa! 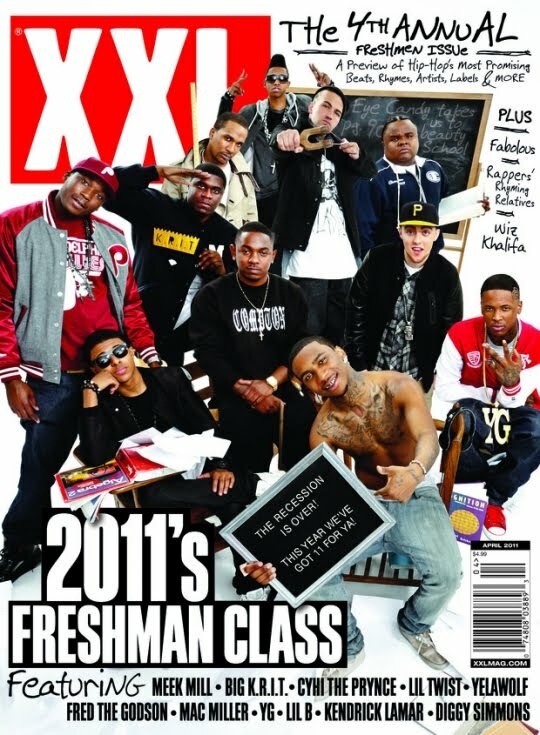 A month before it hits newsstands, eighty8clothing got a hold of XXL‘s 2011 freshman class. Here’s a roll call from the top. Starting at the the left: Lil Twist, CyHi Da Prynce, Big K.R.I.T., Meek Mill, Diggy Simmons, Kendrick Lamar, Yelawolf, Fred The Godson, Mac Miller, Lil B, and YG. Studio Life: Cyhi da Prynce speaks on the 2011 XXL Freshman cover from 3 Little Digs on Vimeo. Labels: Big K.R.I.T., Blvdave, CyHi Da Prynce, Diggy Simmons, Fred The Godson, freshman 2011, Kendrick Lamar, Lil B, Lil Twist, Mac Miller, Meek Mill, Music, Noemi Media Group, xxl mag, Yelawolf, YG.